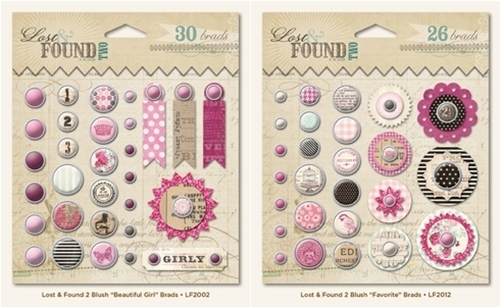 Have you seen the sparkly goodness that is My Mind's Eye Lost and Found 2 Blush? Holy wow! -These fabulously sparkled papers don't leave me feeling like I need a shower after using them! Of course, they loose a bit of glitter, here and there but for the most part, that glitter is here to stay! - The patterns are just right. 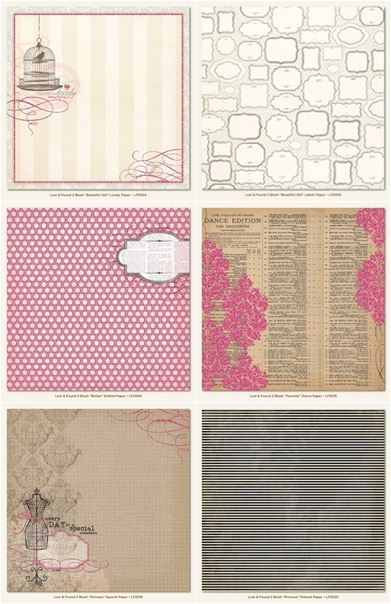 The perfect combination of soft and bold patterns make this a wonderful vintage, girly collection. - You really can't beat the weight of My Mind's Eye papers. They are perfect for distressing and die cutting. 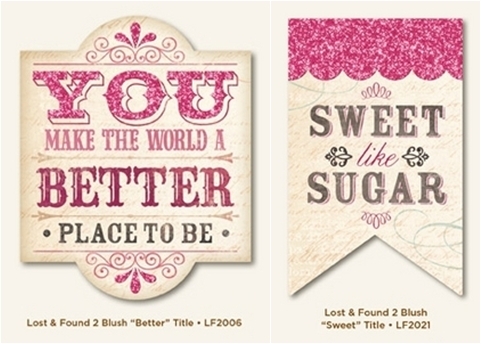 - The stamp images are perfect for cardmaking, but I would like to see some of them a bit bigger. I felt like they were too small for a layout. -That really was about it. It truly was a pleasant surprise to work with this collection. I LOVE IT! Even though I'm not a super girly scrapper it definitely satisfies my frilly side! Will you be sure to pick some up on your next shopping trip? Have you already bought this? Do you love it like I do? Or is it not for you? Let us know! Leave a comment including your email address by midnight PST on Tuesday to be entered to win a prize pack from My Mind's Eye! U.S. residents only. Mandy, I love your projects from this collection. I'm sure this is one collection that I would purchase because of the papers. I love the style. Thanks for sharing. 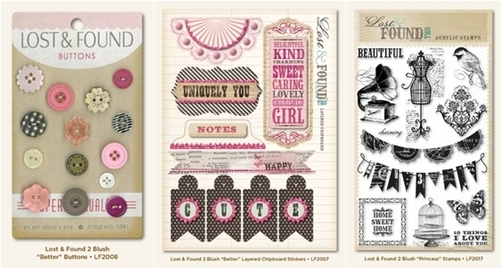 I love the style and the girly-ness of the papers! Thanks for your opinion! I was wondering about the stamps myself. I love the muted colors in this line...perfect for the new little girl in my life. Love the projects! I second your opinion on this collection. It is wonderful. I love MME and both Lost and Found collections are my favorites. Thanks for sharing the beautiful projects. I am in love with this collection! I have already bought a few sheets of the paper, but definitely need more! I love MME . I would buy all of this collection and I have boys. It is very versital. I lovve what you did with the collection, great work. I've got to say I love the colors. So soft and muted. Very cool. I think I will like this line. thanks for sharing. 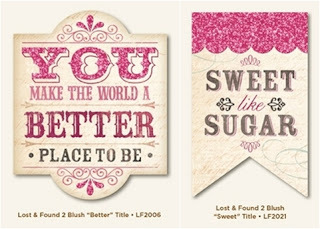 I love MME and this line would be perfect for my two little girls! I love this collection. I make cards and it will be perfect for valentines day!! I have to say that MME has been pretty consistent with releasing quality products that I want. I adore the design, the colors everything. Thank you so much for creating such beautiful work for us to be inspired with, very nice! I think this is absolutely GORGEOUS!!! MME has always been on of my top 5 favorite companies. They definitely don't disappoint at all! I can't wait to get my hands on some of this line! Love the card and layouts that you came up with! Sparked some inspiration! I love the Lost and Found lines and this one's colors are just so lovely! 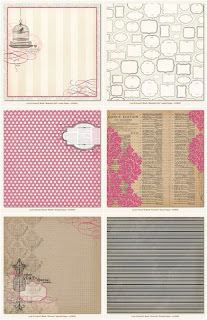 I love, love, love MME and how well everything coordinates and how terrific layouts look! i like almost all MME and this collection is no exception. 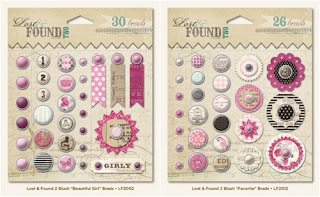 That pinkish color goes great with black, grey and kraft--seems pretty versitile to me. i would have no trouble using all of this line. Cute projects, btw! I really like the trees on your JOY card. This is another gorgeous line by MME! Love the projects you created! Your projects are fabulous and this is such a gorgeous collection! Thanks for the chance to win! I KNOW I WILL buy this collection (unless I win it, LOL)! What you made with it makes me want it all the more. I don't like bright girly, floral, but this muted pinks and old fasioned look is the only girly stuff I love. I love this line! I haven't been able to pick any up but would love to have some! oOOOH, yummy!! I really love this! The pink isn't too bright, and it's girlie but not over the top. I even like the stamps, because I'm a big card maker!! Love this collection! Pink with black is a great combination and when you mix it with kraft...well, perfection! I like the stamp sizes for cards but you could also layer smaller images to make embellishments for layouts. I definitely love this collection. I have the 6x6 paper pad and I'm actually hoarding it as much as I can. I love the buttons & brads too. Just gorgeous patterns and colors. I think it's a pretty line but I won't be buying it because I have an overload of pink girly supplies. I do like your layouts! This is a gorgeous collection, right up my alley and the stamps are perfect for me since I make so many cards these days..Thanks for the chance to win!! I love this collectoin and own some of it but not all of it. I would LOVE to have more pieces from it!! such a gorgeous line! love it! SO pretty!! I love My Mind's Eye!! I think their collections are so complete and fabulous!! Love this! love this! love this! this is sooo me! want this!